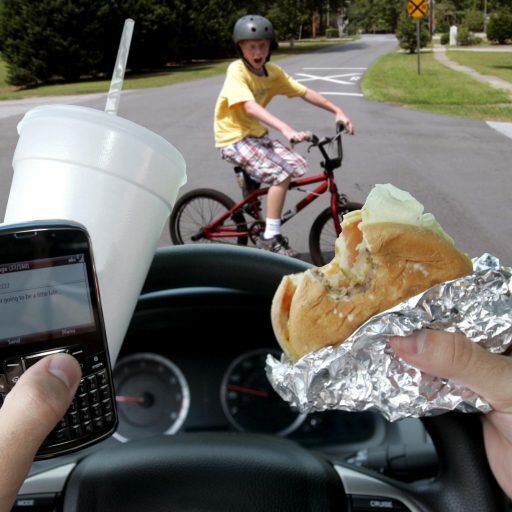 One of the most dangerous activities that nearly all of us have participated in is distracted driving. This is a very broad term, and refers to any time a driver’s attention is drawn away from the task of driving in a safe and defensive manner. This includes everything from tuning the radio, using a navigation system, reaching for objects or even looking at a beautiful sunset. It also includes using a cell phone while driving. Smart phones are amazing; they improve our lives in so many ways, but they become deadly when being used while driving. It is so important to always concentrate on the road and stay 100 percent focused while driving, especially since there is so much out of our control while operating a motor vehicle, such as bad weather conditions and dangerous potholes. Texting while driving has become a major problem nationwide, especially in New York, and is one of the leading causes of car accidents. A study from the University of Utah found that college students showed an eight fold greater crash risk when texting while driving. Statistics show that texting while driving requires a person to take their attention away from the road for approximately five seconds, making a driver 23 times more likely to crash. So, if traveling at 55 miles per hour, it equals driving the length of a football field without looking at the road. Pretty scary, right? In 2009, New York enacted Section 1225-d of the Vehicle and Traffic laws of the State of New York which governs texting while driving. Under the law no person shall operate a motor vehicle while using any portable electronic device while such vehicle is in motion. Seventeen states have passed laws banning texting while driving, including California, Connecticut, Illinois, and New Jersey. This prohibition will make our roads safer. Government agencies realize that texting while driving has become a huge problem; therefore Governor Cuomo has created special “Texting Zones” along New York highways. Texting Zones are simply designated parking areas where motorists can pull over to check and send text messages. These signs should make drivers think twice before reaching for their phone to text. Keep yourself safe and don’t get distracted while driving. The text messages, phone calls, emails, games and apps will all be waiting for you when you get home.